This day is just the perfect day to be grateful for the little things, like, the air we are breathing and the sun that is shining. Which ultimately reminded me of the magical time I've had on the garden island of Kauai. I've got to visit Kauai a couple of years ago and have been wanting to return ever since. 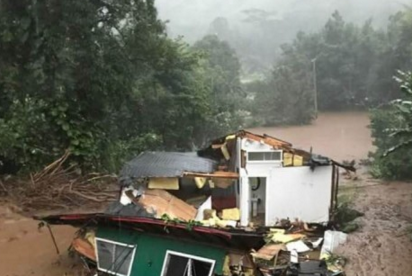 Recently though, torrential rains brought down hillsides, collapsed roads and destroyed hillsides on the island of Kauai. Emergency rescue crews evacuated hundreds of people from areas on the North Shore where a dozen landslides made travel by car impossible. Many residents were stranded without electricity or water. So I decided to donate some money to help reconstruct this island paradise. I don't have much money but I want to give a back a little something at least to Kauai which has nourished my soul in the most magical way. What are YOU doing on earth day to give back? Below you'll find a short story have written a couple of years ago when I got to visit Kauai for the first time. Maybe I should get back writing more short stories again. What do you think? The sun and the moon were both visible in the clear early morning sky performing a ray of light raising behind the dunes in a sea of liquid gold on the Garden Island of Kaua’i, when listening to my favorite song “Chasing Waterfalls“ by TLC I got out of the shower, realizing my French toast was already waiting for me on the balcony table. “Thank you, Baby!“, I exhaled happily trying to place a strawberry together with a slice of the French toast both at a time on my fork. I’ve never known how I deserved him in the first place. I couldn’t help it, though, not falling for him when those piercing blue eyes of his met my gaze directly making their way through to my very heart. All of a sudden, anxiety crept in as my mom entered the room to lend me a helping hand. Being so very truly touched by the speech I wouldn’t think I could bare a life not waking up to this handsome face of my soulmate’s anymore when suddenly I felt tremendously dizzy. Woken up by someone gently shaking me while screaming my name I caught his piercing blues with the glimpse of the eye:“ I was so worried about you. You’d been unconscious for over 10 minutes when a stone came down the waterfall and hit you right in the face.“ That’s when I realized the day that should have changed my life is still yet to come.